Home > Jobs > News > Training > As a generation of airline Captains retires, who will sit in the left hand seat? As a generation of airline Captains retires, who will sit in the left hand seat? 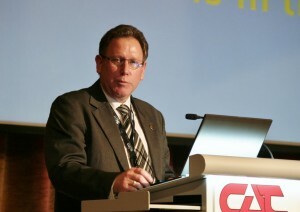 Speaking at the Asia Pacific Airline Training Symposium (APATS) in Singapore at the end of August, CTC Aviation Training (NZ) Limited Managing Director, Ian Calvert has urged Flight Training Organisations (FTOs) and airlines worldwide to ensure they select and recruit tomorrow’s pilots with a Captain’s skill set in mind. “For the past fifty years, the aviation industry has seen large numbers of civilian and military aviators gain a range of experiences and training through exposure to extremely challenging flying situations. “That generation of pilots had the maturity and abilities required to assume the role of airline Captain with ease. They were people with a skill set that commanded respect and who led with confidence. “For the past decade, however, we’ve seen this generation of Captains begin retiring en masse. We need to ensure we are training the next generation of pilots who can assume these vacant left-hand seats when the time comes,” explained Mr Calvert. Mr Calvert said maintaining high Captain standards throughout the industry will only happen if FTOs recognise they must recruit, train, and manage a pilot into the left hand seat in a different manner and work hand-in-hand with their airline partners. “As more senior pilots retire or lose medical fitness, it is not simply a matter of replacing like for like. With the skyrocketing number of new pilots required worldwide over the next five years, this won’t be possible. “We believe the solution lies in establishing a close airline-FTO partnership to address these issues, even before selection, to determine the exact ‘person specification’ required. This partnership must then be continued through a structured command skills development programme until that pilot gains command. “Selecting the right candidate today must include focusing on the person’s personality. The right trainee must have maturity beyond their years, be calm and focused, demonstrate commitment and knowledge of aviation and be willing to adapt and learn. “After selection, FTOs must then nurture trainees. No longer can training be just about teaching stick and rudder skills. Cadets must be guided in decision making – in and out of the training environment – in areas related to teamwork, career planning, plus inter-personal and communications skills. “FTOs must encourage trainees to have positive personal interactions and realise what are appropriate and non-appropriate behaviours. Ultimately, we want trainees to have an inquisitive and questioning thought process – one especially focused on safety and team performance,” Mr Calvert explained. Mr Calvert ended his speech by encouraging fellow FTOs to join with CTC Aviation to develop their recruitment and selection processes and play their role in keeping the industry safe. He also urged airlines to follow in the footsteps of operators such as IndiGo who recently selected CTC to deliver command skills development programmes for their future Captains. “The figures that are being quoted in our industry regarding future pilot requirement suggest that around 450,000 new pilots will be employed over the next 18-20 years. We must not forget that with such growth comes a need for more rapid promotion to command. While some people undoubtedly have natural leadership potential, it is essential that they are assessed for command potential at an early stage and taught the correct application skills. “It is not a simple step from the right-hand seat to the left and as a rapidly growing industry we must ensure that we fully equip our aircrew for their jobs. “As numbers of aircraft, passengers and airports increase, we cannot ignore the future and who is sitting in the left hand seat,” said Mr Calvert.